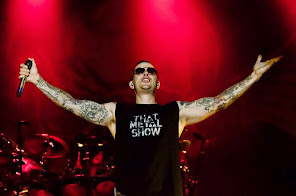 Avenged Sevenfold News: M.Shadows about This Means War video: "I think everyone will be happy with the new video, especially..."
M.Shadows about This Means War video: "I think everyone will be happy with the new video, especially..."
"Honestly when we were shooting the video we were pretty excited about it. After a few attempts of editing it the video just looked bad, dragged on and just didn't do anything for us. Especially since most people didn't get the vision we were going for w the Shepherd of Fire video, we just didn't want to come next with a 6 min. boring video of a bunch of people rioting. At the end of the day all that really matters is we didn't like it so we canned it. I think everyone will be happy with the new video, especially our South American / Mexico fans." "Argentina, Brazil, Mexico City and Chile are all up in the video! hahah"